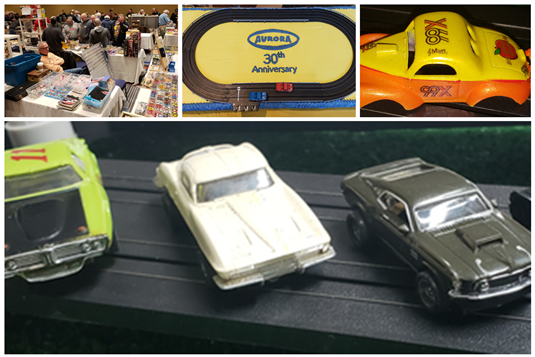 I don't know what I look forward more to on Super Bowl Sunday, the game or the largest slot car show in the country that happens right here on Long Island. As the game was featuring the Rams and Patriots, I didn't have anything invested other than the fact I'm not a Patriots fan. Had the Jets or Giants been playing, it would have been necessary for me to watch. • A slot car weekend. Actually, it turned out it was slot car weekend, running from Friday night through Sunday morning. I had been talking to my friend Rob about the annual slot car show for a while. The week before, we were talking about going to dinner on Saturday night, with some other slot heads that were going to be in town. Then Rob invited me to the home of his friend, Pete, on Friday night. Pete used to own a delicatessen in West Hempstead near the old Aurora Plastics factory. The workers would give him goodies from the factory, many of them rare. That started Pete on interest in slot cars. After he sold his store and retired, he continued collecting track and cars. He has a true man cave in his basement, all dedicated to slot cars. He has a custom HO track that has a twenty-foot back straightaway, which is amazing for racing. This was the first time I was invited. I brought some cars. We were off to the races, literally. Another friend, Andrew, came with two of his friends; we were like little kids racing our cars around this amazing track. Pete also has a figure-eight demolition derby track with which we had a blast. On Saturday night, I met Rob and three other fellows at a restaurant in Farmingdale, about five minutes away from the Hilton Hotel where the slot car show was going to be the next day. One of the fellows, Jim from Florida, is a huge collector. He’s also an expert customizer and restorer of our little cars. I had sent Jim four bodies to work on; he managed to get three done. The other one was a big job that he didn't finish it. I told him when it's done it's done. I also gave him two more cars work on and to send them back together. • Radio station decals on slot cars. One of the cars he did was truly special. Jim from Florida made some 99X decals, the old WXLO-FM, in New York City, my Big Apple Airchecks website log and my name, all custom painted. It is a work of art. Then there was Joe from Buffalo; although we're Facebook friends, we had never met. We hit it off right away. It turns out one of his good friends is Bob, from Slot Car Central in Syracuse, New York, where my father lives and whose store I had visited a couple of times. Joe from Missouri showed up. I didn't really know him since he uses a different name on Facebook. Again, we hit it off right away. After dinner, we all went to the Hilton. Joe gave us a preview of what he was going to sell the next day. Both Rob and I bought a couple of things. I was especially happy with getting a Mustang and split window Corvette. We hung out with some of our slot friends in the lobby. I called it a night at 11 pm. I had to get up at 6 am on Sunday to get to the show by 7:30. It actually opened at 7 am, but there was no way I was going to get there at that time. I did make it by 7:30 am. I bought the merchandise I wanted, early. Then I just hung out with Rob and wandered the show. My biggest want was an Aurora AFX Lime #11 Lime Green Charger. I got it from a dealer I met in the past, Bill from Maryland. It was in nice shape and after a little haggling, we agreed on a price. I also did a trade with Joe, who owned a Mustang body that I didn't. I had brought two Mustang bodies that were duplicates, so for them and $5 I got a body worth much more. Yes, I like Mustangs, as I once owned a 1986 Mustang GT. I got to work by 10:30 am and left at 4:15 pm. I was dead tired and wanted to rest before watching the Superbowl. The highlight was Gladys Knight singing the National Anthem. It was downhill from there. The half time show was boring; the defensive game itself was, well, boring. • Will the Jets play the Giants next year? I watched the trophy ceremony and went to sleep right after that. I think I fell asleep a couple of times during the game. I hope that next year the Jets and Giants will play in the Super Bowl. My father and I can only hope and pray.